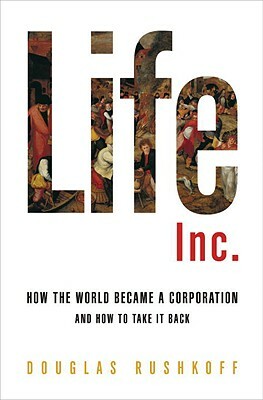 In Life Inc., award-winning writer, documentary filmmaker, and scholar Douglas Rushkoff traces how corporations went from being convenient legal fictions to being the dominant fact of contemporary life. Indeed, as Rushkoff shows, most Americans have so willingly adopted the values of corporations that they’re no longer even aware of it. This fascinating journey, from the late Middle Ages to today, reveals the roots of our debacle. From the founding of the first chartered monopoly to the branding of the self; from the invention of central currency to the privatization of banking; from the birth of the modern, self-interested individual to his exploitation through the false ideal of the single-family home; from the Victorian Great Exhibition to the solipsism of MySpace–the corporation has infiltrated all aspects of our daily lives. Life Inc. exposes why we see our homes as investments rather than places to live, our 401(k) plans as the ultimate measure of success, and the Internet as just another place to do business. Most of all, Life Inc. shows how the current financial crisis is actually an opportunity to reverse this six-hundred-year-old trend and to begin to create, invest, and transact directly rather than outsource all this activity to institutions that exist solely for their own sakes. Corporatism didn’t evolve naturally. The landscape on which we are living–the operating system on which we are now running our social software–was invented by people, sold to us as a better way of life, supported by myths, and ultimately allowed to develop into a self-sustaining reality. It is a map that has replaced the territory. Rushkoff illuminates both how we’ve become disconnected from our world and how we can reconnect to our towns, to the value we can create, and, mostly, to one another. As the speculative economy collapses under its own weight, Life Inc. shows us how to build a real and human-scaled society to take its place. Douglas Rushkoff is a widely known media critic and documentarian. He has written ten books, and his documentaries include Frontline's award-winning "The Merchants of Cool" and "The Persuaders." He teaches media studies at the New School, hosts The Media Squat on radio station WFMU, and serves on the board of directors of the Media Ecology Association, the Center for Cognitive Liberty and Ethics, and the National Association for Media Literacy Education. He has won the Marshall McLuhan Award for Outstanding Book in the Field of Media Ecology and was the first winner of the Neil Postman Award for Career Achievement in Public Intellectual Activity.